Transporting freight is crucial to Mackinac Island residents, businesses and visitors. Star Line now offers reliable and timely freight departures beginning at 6:30 AM every weekday and Saturday from our St. Ignace location only at Dock #2. Please call 906-298-1737 for competitive rates. *It is considered a full cart if nothing else can be added to the cart. 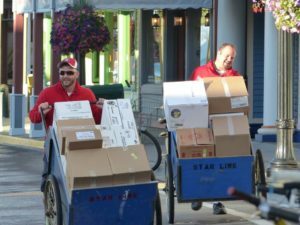 Star Line is dedicated to getting freight to Mackinac Island efficiently & safely. I just wanted to take a moment to share with you how appreciated your new freight department is by us here at the Inn on Mackinac. 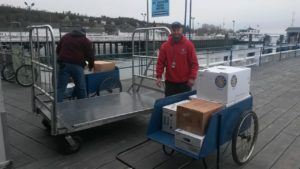 When I say that you have better service than we received from another ferry line, I would like to let you know that our freight arrives each morning between 7:30 am and 7:40 am and is delivered to our kitchen unlike before when it was set on the sidewalk in the middle of the day. Your company makes sure everything we ordered is there and calls Sysco to correct the problem before informing us of the issue, saving us valuable time during a busy morning. You also keep us informed from the moment the order is delivered, if the Sysco truck is running late and thus you will be as well. Your crew is personable and interacts well with all of the staff, who are all much happier now that their supplies are being delivered before they even need them. IT IS TOP NOTCH SERVICE AND BY FAR A MILLION TIMES BETTER THAN THE SERVICE WE HAD BEEN RECEIVING. Keep up the good work in your expansion of the freight company!